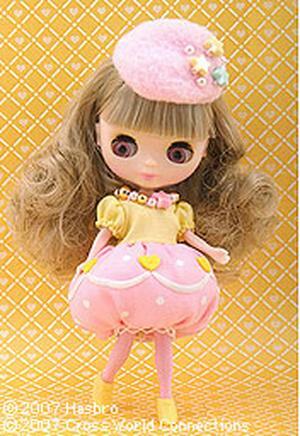 As her name suggests, "Miss Macaroon" is a very cute and sweet doll. She wears silver beads that looks likes argent on a cake! Her one piece dress is shaped like soft whipped cream and her beret is shaped like a macaroon. Her long, wavy, hair is the color of milk tea and her bangs cover her enchanting pink strawberry eyes . Her cheeks and lips are bright pink and her eyeshadow is a brilliant yellow.